Arrow Schmidt Peterson Motorsports driver Ericsson met Ibrahimovic at the Carson, California, training facility of the LA Galaxy, the MLS team for which the colorful Ibrahimovic has played since 2018 after an illustrious career as an elite striker in European domestic leagues. Ericsson presented Ibrahimovic – known by his first name only or as “Ibra” to his legions of global fans – with a racing helmet adorned with the logos of the LA Galaxy, NTT IndyCar Series and 103rd Indianapolis 500 presented by Gainbridge. Ericsson also gave Ibrahimovic an empty milk bottle featuring this year’s Indy 500 logo. The two Swedish sports stars spent a few moments chatting and exchanging handshakes. Ericsson, 28, came to the NTT IndyCar Series this season after five seasons as the only Swede in Formula One. Ibrahimovic, 37, was a prolific goal scorer for more than a decade for some of the giants of European club soccer, including Manchester United, Barcelona, Juventus, Inter Milan, A.C. Milan and Paris Saint-Germain, before coming to Los Angeles last season. Ibrahimovic and his outsized personality have attracted a huge global social media following, as he has 36.4 million followers on Instagram and 5.67 million followers on Twitter. Ericsson is in Southern California this weekend to compete in the Acura Grand Prix of Long Beach on Sunday, April 14. 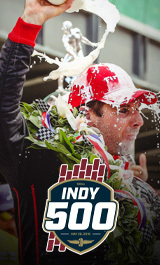 It’s the last NTT IndyCar Series event before the Month of May at IMS, which features the INDYCAR Grand Prix on Saturday, May 11 on the Speedway’s road course and the 103rd Indianapolis 500 presented by Gainbridge on Sunday, May 26 on the oval.